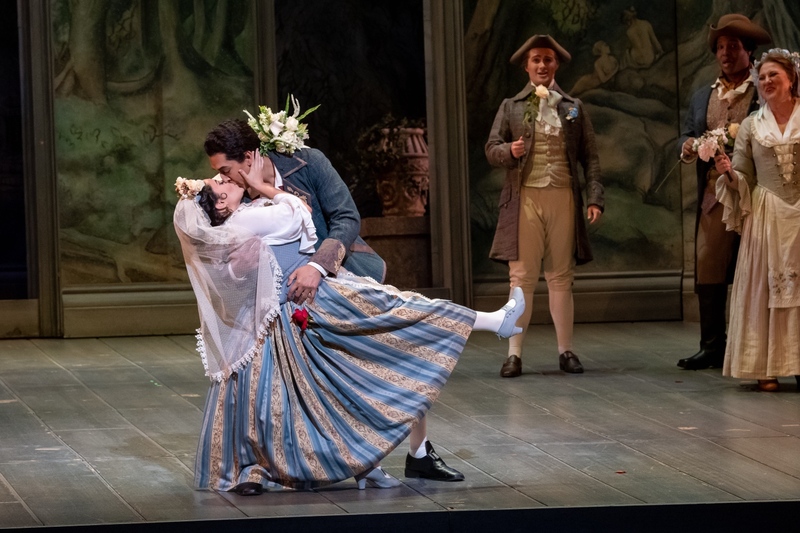 Le nozze di Figaro, Florida Grand Opera, 2019. Photo: Chris Kakol. Figaro thinks he’s got it made. The Count has granted him and his fiancée the finest servants’ quarters in the entire Almaviva estate, conveniently adjacent to the bedroom of the Count and Countess themselves. “Show me a better room,” Figaro challenges his bride-to-be. Predictably, Figaro doesn’t believe her. 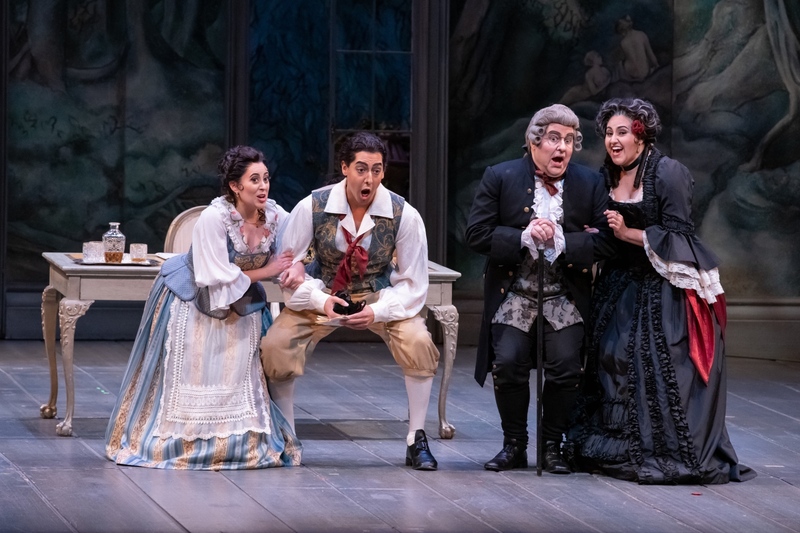 Florida Grand Opera’s Le nozze di Figaro, which opened on January 26 at the Adrienne Arsht Centre in Miami, took an uncharacteristically introspective look at this iconic comedic favourite, in a production that asked all the right questions, but sacrificed some laughs along the way. Bass-baritone Calvin Griffin sang a guileful and steady Figaro opposite Elena Galván’s clear and glimmering soprano. As Susanna, Galván was sharp and savvy, standing firm against the Count and offering perceptive, quick-witted asides as the wedding-day chaos unfolded. Galván seemed to have fun in her role, with a compelling lightness and organic ease in both her acting and singing. In a musical highlight of the evening, soprano Lyubov Petrova’s Countess balanced a dolce upper range and thoughtful musicality with effusive regality and confidence. Petrova’s “Dove sono” melted into breathtaking diminuendi, while her triumphant pause in response to the unfaithful Count’s pleas for forgiveness captured a commanding presence and deft comic pacing – even without singing a single note, Petrova caught some of the show’s biggest laughs. Bass Simon Dyer nailed gardener Antonio’s drunken antics, while tenor Dylan Morrongiello’s strongly acted Don Basilio was worthy of a spinoff appearance guest-hosting E! 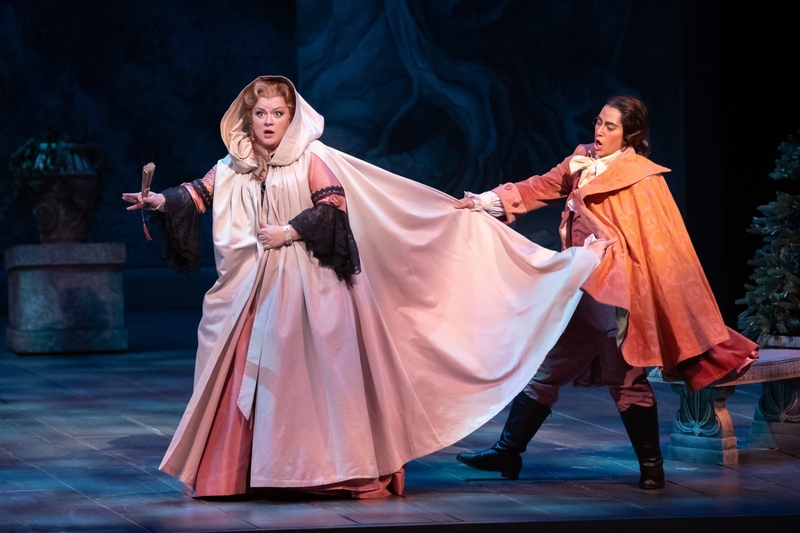 News, and soprano Evan Kardon’s Barbarina was sung with splendid tone and a healthy dose of sass. As Cherubino, mezzo-soprano Mariya Kaganskaya also sang resonantly, but struggled to hit punchlines. 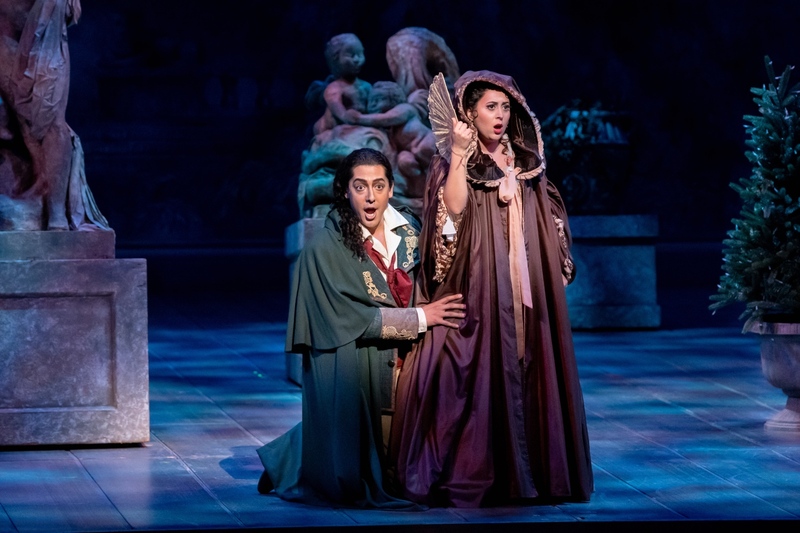 Likewise, mezzo-soprano Zaray Rodriguez as Marcellina and bass-baritone Rafael Porto as Doctor Bartolo captured odd-couple charm, but with downplayed humour. As a result, moments of overt comedy seemed out-of-place. The wedding party’s viral video-esque entrance down the aisle felt awkward and slapstick, and Figaro’s “Aprite un po’ quegli occhi,” while well sung, came across like tired, sexist stand-up at a brick wall club: “Women! Am I right?” Even accompanied by Mozart’s high-octane score, punctuated by fluttering woodwind solos well played under conductor Andrew Bisantz, the production missed more than one comedic mark. Indeed, Count Almaviva crosses that line. 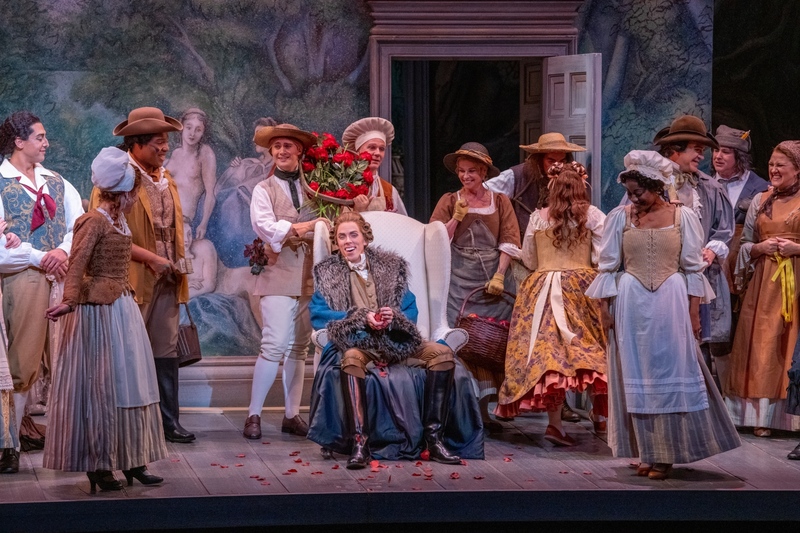 Raffish and conniving, baritone Jonathan Michie sang a stentorian Count oblivious to the toxicity and trauma he inflicts on the women in his life. He’s the sort of man who, earlier this month, would have thrown out his Gillette razor in protest. 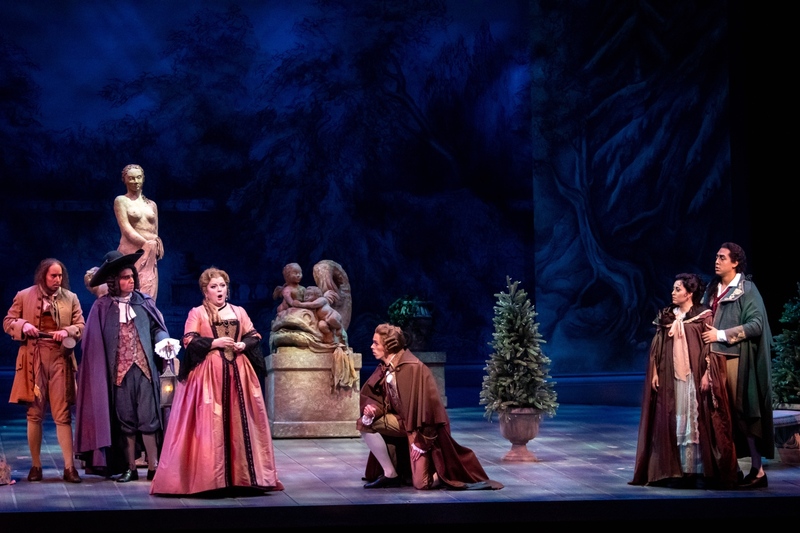 Sandell’s timely vision was mirrored by Susan Benson’s set design, originally for Michigan Opera Theatre, elaborately painted yet muted and, at times, grim – lent depth and occasional gloom by lighting designer Helena Kuukka. Notably, almost the entire creative team were women, suggesting that this opera, when seen through a lens other than the hegemonic male gaze, has a not-so-funny message to impart. In the end, it is the strength and persistence of the opera’s women, and their support of one another, that brings the Count to his knees. It’s fitting, then, that following three acts of humour falling flat, the biggest laugh of the evening came not from the Count’s repeated EEOC violations, nor from Figaro’s bumbling jealousy, nor from Cherubino’s handsy hijinks – but rather from the victorious Countess, now in a position of power, pausing for a beat too long before answering her husband’s pleas with an all-too-generous blessing of forgiveness. Le nozze di Figaro runs at Florida Grand Opera though February 9. For details, click here.